Happy Valentine’s Month beautiful readers! I’ve never won anything. (At least not anything that I really wanted.) Have you? Spirit Beauty Lounge and I have teamed up to make it happen for 18 of you! Let the ‘for the love of green beauty’ gift giving begin!! Every weekday for the rest of this month you have the chance to win one of the beautiful gifts featured above. 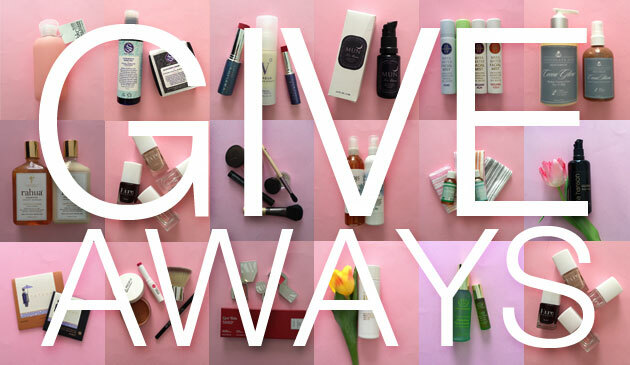 There’ll be a mixture of our favorites in green beauty, from skincare and haircare to makeup and nail polish from brands like Lina Hanson, Kjaer Weis, Tata Harper, Ila, W3LL people, Rahua, RMS, Mun, Strange Invisibles, Maya Water, Vapour Organic Beauty, Soapwalla Kitchen, Chocolate Sun, Alima Pure, Tatcha, Dr. Bronners, Kure Bazaar, BKR. It’s super simple to enter; just click through the prompts on my Facebook page. The first giveaway is the delicious face oil from Mun… you won’t be disappointed!! !